Marshall E. Cates has taught psychiatric pharmacy at McWhorter School of Pharmacy since 1995. He has extensive clinical experience in psychiatric pharmacy practice, including inpatient psychiatry, outpatient psychiatry and geriatric psychiatry. 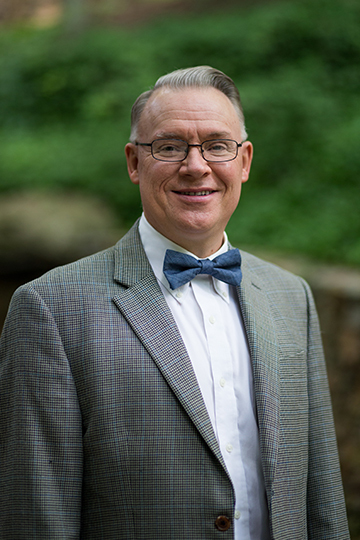 His current practice site is Brookwood Baptist Medical Center (inpatient psychiatry), and beginning in 2018 he will also practice one morning per week at the Jefferson County Department of Health (mental health clinic). He holds a voluntary appointment as clinical professor of psychiatry at UAB School of Medicine. Cates was among the first group of pharmacists to become board certified in psychiatric pharmacy in 1996. He founded and directed an ASHP-accredited residency in psychiatric pharmacy practice at the Tuscaloosa VA Medical Center. His research and publication efforts have concentrated on psychiatric pharmacotherapy, mental illness attitudes of pharmacists and pharmacy students and pharmacy education. Dopheide JA, Bostwick JR, Goldstone LW, Thomas K, Nemire R, Gable KN, Cates M, Caballero J, Smith T, Bainbridge J. Curriculum in psychiatry and neurology for pharmacy programs. Am J Pharm Educ. 2017;81(7):5925. Cates ME, Woolley TW. Effects of a psychiatric clinical rotation on pharmacy students’ attitudes toward mental illness and the provision of pharmaceutical care to the mentally ill. Ment Health Clin. 2017;7(5):194-200. https://doi.org/10.9740/mhc.2017.09.194. Baker JF, Cates ME, Luthin DR. D-cycloserine in the treatment of posttraumatic stress disorder. Ment Health Clin. 2017;7(2):88-94. http://dx.doi.org/10.9740/mhc.2017.03.088. White CW, Boyd K, Luthin DR, Cates ME. Posttraumatic stress disorder: disease characteristics and treatment. Consultant. 2016;56(6):496-501. Cates ME, Clark A, Woolley TW, Saunders A. Sleep quality among pharmacy students. Am J Pharm Educ. 2015;79(1):09. Cates ME, Kamei H. Changes in attitudes of Japanese pharmacy students towards mental illness during the didactic portion of the curriculum. Pharm Educ. 2013;13(1):145-150. White W, Elmore L, Luthin DR, Cates ME. Psychotropic-induced weight gain: a review of management strategies. Consultant. 2013;53(3):153-160. Gibbs EN, Cates ME. The role of propranolol for post-exposure chemoprophylaxis of posttraumatic stress disorder and acute stress disorder. Ment Health Clin. 2013;2(7):33. http://cpnp.org/resource/mhc/2013/01/role-propranolol-post-exposure-chemoprophylaxis-posttraumatic-stress-disorder. Cates ME, Hogue MD. Experience with a drug screening program at a school of pharmacy. J Am Coll Health. 2012;60(6):476-480. Cates ME, Neace AL, Woolley TW. Pharmacy students' attitudes toward mental illness at the beginning and end of the professional curriculum. Curr Pharm Teach Learn. 2012;4(2):132-136. Cates ME. Effects of an elective course involving mental illness-themed movies on pharmacy students’ empathy toward mentally ill patients. College of Psychiatric and Neurologic Pharmacists Annual Meeting, Phoenix, AZ, Apr. 2017. Cates ME, Woolley TW. Effect of duration of clinical exposure to mentally ill patients on pharmacy students’ stigmatizing views. International Pharmaceutical Federation (FIP) World Congress of Pharmacy and Pharmaceutical Sciences, Düsseldorf, Germany, Oct. 2015. Cates ME, Woolley TW. Pharmacy students’ attitudes toward suicide prevention are improved after participation in a psychiatric pharmacy clinical rotation. International Pharmaceutical Federation (FIP) World Congress of Pharmacy and Pharmaceutical Sciences, Düsseldorf, Germany, Oct. 2015. Cates ME, Woolley T. Pharmacy students’ attitudes toward provision of pharmaceutical care to mentally ill patients are improved after participation in a psychiatric pharmacy clinical rotation. American College of Clinical Pharmacy Virtual Poster Symposium, May 2015. Cates ME, Woolley TW. Pharmacy students’ attitudes toward mental illness are unaffected by participation in a psychiatric pharmacy advanced pharmacy practice experience. College of Psychiatric and Neurologic Pharmacists Annual Meeting, Tampa, FL, Apr. 2015. Cates ME, Thomas AC, Hughes PJ, Woolley TW. Effects of a focused continuing education program on pharmacists’ attitudes toward suicide prevention. College of Psychiatric and Neurologic Pharmacists Annual Meeting, Tampa, FL, Apr. 2015. Cates ME, Mullins KM, Woolley TW. Improvement in pharmacy students' attitudes toward mental illness as the result of participation in an elective course based on mental illness and treatment in the movies. American College of Clinical Pharmacy Annual Meeting, Albuquerque, NM, Oct. 15, 2013. Cates ME, Hogue MD, Woolley TW. Does participation in actual drug testing influence the attitudes of first-year pharmacy students toward mandatory drug testing? American College of Clinical Pharmacy Annual Meeting, Albuquerque, NM, Oct. 15, 2013. Cates ME, Davis LL, Ebong EE, Lowe JS. Second generation antipsychotic prescribing patterns for veterans with posttraumatic stress disorder over a ten-year period. Encore presentation. American College of Clinical Pharmacy Annual Meeting, Hollywood, FL, Oct. 24, 2012. Cates ME, Phillips AC, Woolley TW. Sleep quality among pharmacy students. American Association of Colleges of Pharmacy Annual Meeting, Kissimmee, FL, July 15, 2012. Cates ME, Oliver M, Hogue MD, Alverson SP, Woolley TW. Attitudes of first-year pharmacy students toward mandatory drug testing at a school of pharmacy. American Association of Colleges of Pharmacy Annual Meeting, Kissimmee, FL, July 15, 2012. Effects of a psychiatric pharmacy APPE on the attitudes of pharmacy students toward mental illness and the provision of pharmaceutical care to mentally ill patients. Does a CE course on suicide prevention affect pharmacists’ attitudes toward suicide prevention?